At home last night I spent a little time fixing some details on the bottle labels- lettering, proportions, etc. In the morning I brought it up to the Studio, along with all my printing supplies. I spent about another half hour making a few more fixes, then got out my tools and started cutting. I didn't expect it to take too long to cut the 8" x 11" block. 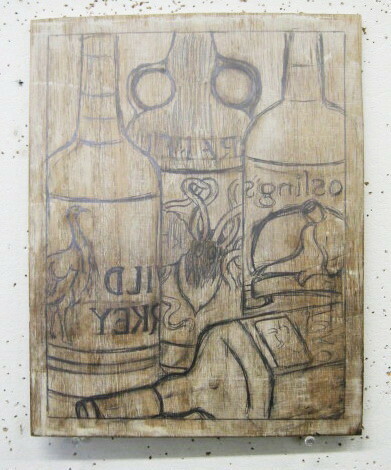 The piece that took the longest was the Wild Turkey bottle (the most that had to be cut out), about 45 minutes. The other bottles went faster, and the whole block took maybe 2.5 hours to cut. I found a piece of heavy printing paper, tore it in half, and had enough paper for two proofs. I opened a brand new can of relief ink, and started inking. Most of it rolled up very easily, but a little trickier around the letters. Below is the first proof. I think it's a good print so far, especially considering that other than gathering the information, it was only two days' work. Good bold graphics, and I think that anyone reading the title should be able to make the connection with the subject pretty quickly. Molly happened to wander through as I was inking and immediately got it, even though we hadn't occasion to discuss it before. I used my gouges to clean up a few of the areas of the block that unintentionally took ink the first time and then pulled a second proof. I'll let them dry a few days and try coloring them next week. If I like the results of at least one of them, I'll submit it to the show. 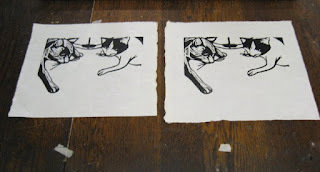 As long as I had the ink out I pulled two quick proofs of the cats block on small pieces of okawara. Much easier than the bottle block, with each print taking less than two minutes to produce. They were also left there to dry until next week. 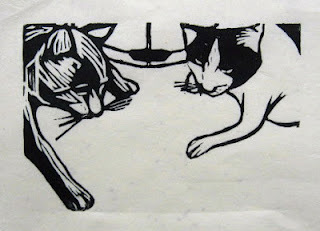 I did find the block with the two cats (postcard project) at home, and I will print another copy of that, but I think I'm going to try to make a new piece as well for next week's Animal Spirits show. The Birds and Seeds hunting scene may not work for this exhibition, but I think the whiskey/spirits thing could still be fun to play with, so I decided to explore that. A few days ago I made a quick stop in a local liquor store, walking up and down the aisles with distilled spirits (whiskey, rum, vodka, gin, etc), noting bottles with animals prominent in the label design. Found several options. Later I went to the internet to look at those bottles a little more carefully, and selected 4 to use in my image. I'm bringing back the Wild Turkey again, along with a couple of rums and a tequila (the last one from an actual bottle I had in the basement). Based on the sketches I made from my sources, yesterday I came up with the paper design above. I went to the Studio late this morning. Despite the coming heat wave it was very comfortable in there, so I kept the windows closed to retain the cool. At first I was thinking of maybe doing this idea as a monotype, but changed my mind. A lot of the stuff I would use for that was back home (supplies I've been taking to the Belmar workshop), and there was enough detail that I decided it wouldn't be that much faster than doing a woodcut. (this composition has a lot of black, won't take that long to cut) I used my prepared block to do a sketch. I had filled in the appropriate values in the paper sketch and decided that I didn't like how it balanced. After looking at it a while, I decided the solution would be to move the tequila bottle in the front, but rather than remove it, I decided to show it laying down in front of the others. (this arrangement is actually a sketchbook assignment I give my drawing students on a regular basis) Above is an early version of this new composition. After a lunch break I started filling in details on the bottles. 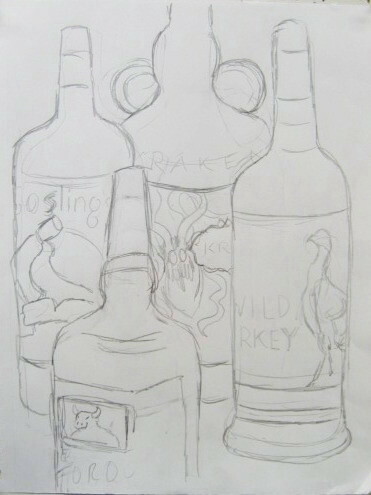 As I spent more time working on the sketch I decided that the perspective on the reclining tequila bottle was not right. At the angle I had it, it was off the table, and possibly occupying the same space as the rum bottle behind it. 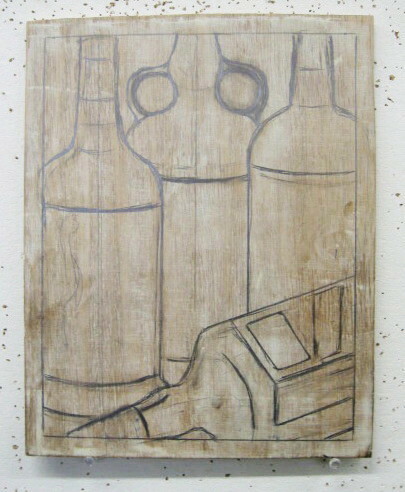 The new version is a little better, though not as accurate as if I had the actual bottle in front of me to draw from. 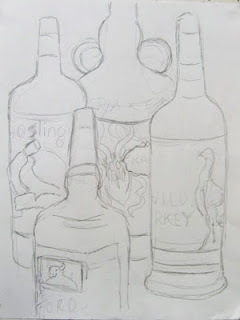 On the way home I stopped off to do a new sketch of that tequila bottle, this time laying down. Tomorrow I make the corrections (slight changes to the neck and label will do it) and cut it. 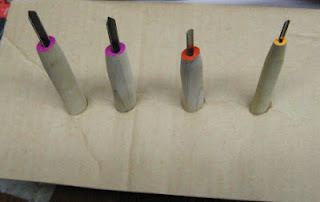 I had bought 9 assorted tools last fall for use in the woodcut workshop in Belmar. At first glance, they all look very similar- shaped metal blades sticking out of plain wooden handles of identical lengths. Each has the name of tool (in Japanese characters) and size on the top of the far end of the handle, not easy to read. Plus there was the matter that I was planning to offer the group a chance to buy similar tools of their own. To distinguish my class tools from those my students might buy, I decided to mark mine. 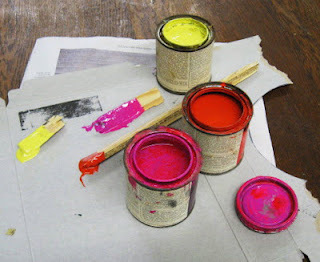 I ended up using some oil based silk screen ink that I last used for my postcard project- they are extremely brightly colored and dry very fast. As it turned out, all my students bought tools, and I added four more to the order to improve my supply. Last night the students reimbursed me for the tools I ordered for them. Since I was going to the Studio today, I brought the four extra new tools with me, and gave them the same color treatment as last year's batch. 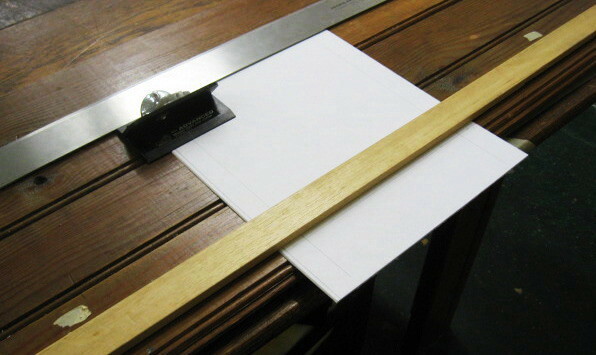 I used the ink to paint the end of the handle where the blade is inserted. And I matched these to the previous set by using color coded ink for each size and type. So in the image below I have two 4.5 mm V gouges (magenta), a 4.5 mm round gouge (red-orange) and a 3.0 mm round gouge (yellow-orange). That gives me a total of 13 class tools to use for the last 2 weeks of the workshop. 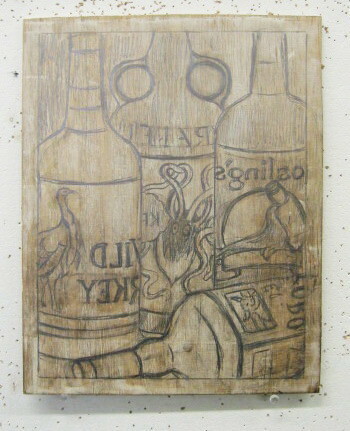 The other thing I did today was prepare the surface of a new wood block. I have some ready made possibilities for a piece for the Animal Spirits show, but I do have an idea I'm playing with right now. If I get it figured out in the next couple of days, I have wood ready to go. 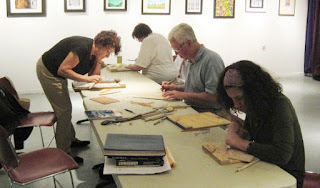 Tonight was the 2nd meeting of my current woodcut class in Belmar. All four of the participants were there on time, ready to work. They were very excited that the tools had arrived, so I started by distributing them and going over how to use each type. Three came with drawings already on their blocks, while the fourth had narrowed down some options and sought opinions on which would be the best for a first print. With that settled, she got a drawing down, and within minutes all were starting to cut their blocks. 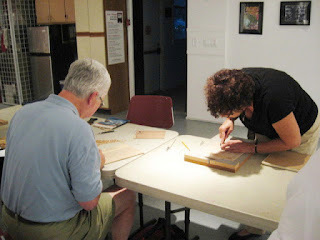 They were surprised at how simple the process of cutting is (quality tools does help) and all made significant process. We're taking off next week for the holiday, but since everyone now owns a few tools, I expect they will all show up for the 3rd week ready to take their first proofs. 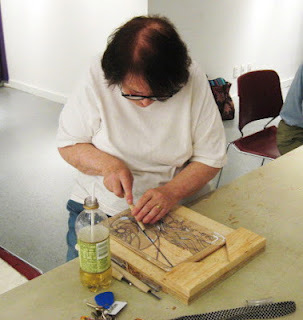 Because I am a coordinator at the Belmar Arts Council, as well as an active member, I usually submit work for all the shows that I have something suitable for. With enough warning, sometimes I can even make something special for the occasion. The current show in Belmar is a nature themed photo show, so I skipped that. Next up is one called Animal Spirits. Pretty simple concept- art inspired by animals, any medium. It's not a focus of my work, but animals have popped up from time to time. 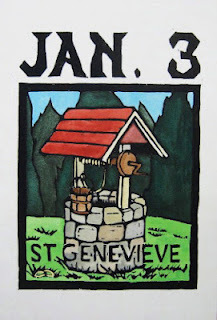 For example, early this year I had St Benno in a show there, with the image being a frog, and the back story being related to the idea of animal spirituality. It would be perfect for this show if I hadn't shown it there already. Animals appear in at least a few of the older ones, and if I don't come up with anything better, I can put one of those in a frame and be done with it. My first print series after returning to New Jersey from grad school had lots of animals. (done so long ago that I don't have any digital images of it to post here) It was a 24 print hand colored series called Birds and Seeds, with each print containing a reference to both birds and seeds. Some are fairly literal (birds on telephone wires outside a feed store, a biblical passage about birds eating recently sown seed), some are built around food (turkey and stuffing, chicken noodle soup), while some are a little more obscure (sheet music that musicians might recognize as "Turkey in the Straw", a vintage Ford Thunderbird driving past a cornfield). Several years ago one of them (birds in the branches of a tree) was used for the BAC calendar, but I don't think I've shown any others there. One of the most popular in the series is based on an actual 50 year old whiskey ad from Life magazine, where the illustration was a couple of hunters in the weeds around a pond, getting ready to shoot some ducks flying overhead. 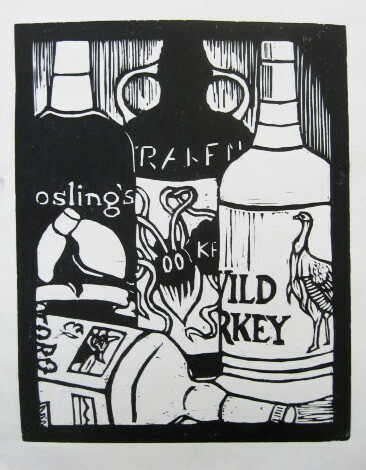 I reinforced the concept by changing the bottle in the ad to Wild Turkey brand (product derived from seeds, bird on the label). That one would work really well- the bourbon would literally be an "animal" spirit. On the other hand, a show that is a benefit for the local Humane Society might not be the best place for a hunting image. On my way to the Studio today I stopped at a former employer to drop off a few things for staff there, including an announcement for this animal show for those who may want to enter. While I was there I was reminded of another possibility. A couple of years ago I participated in the For Love Not Money collaborative postcard project. Stumped at first as to what to create to add to an image of a checkerboard and some tea bags, a co-worker suggested animals on the floor. I changed her suggested dogs to cats, but it was the same concept. The image above is a print of the block that I carved, and you can see here how the image was added to my collaborator's card. 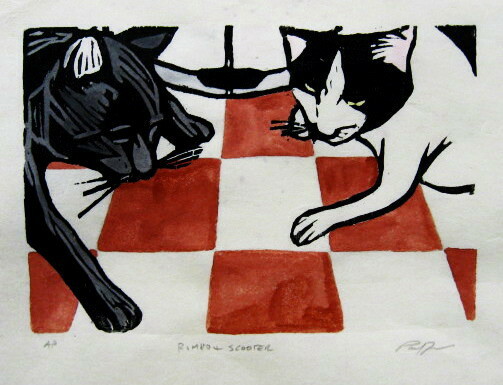 To thank the person who gave me the idea, I used a little watercolor and the block print to make her the piece seen below, which I saw hanging on her bulletin board today. Using this block as a starting point for a new piece is a possibility. From there I went to the Studio. Couldn't find the cats block, but I figured there was a good chance I had taken it home to show in some demonstration and hoped to find it there later. Meanwhile I cut myself a small wood panel, about 8" x 11", on the chance that I decide to create something from scratch over the next few days. Intake is a week from Friday/Saturday, so whatever I do has to be printed by the end of this week to be ready to frame in time for the show. The fall semester is still almost 3 months away, but it's time to start teaching again. My latest round of woodcut classes at the Belmar Arts Council began tonight. Last fall I had three people sign up, but only two showed up on the first night, and the third was never heard from again. Coming into tonight's meeting I was expecting to have three students again, but it turned out that I had four, the extra telling me she signed up online Saturday. I'll verify that with the office tomorrow, but meanwhile we got the process started. The first hour was a little rough, with the sudden return of some of my cold symptoms, but I things improved considerably after that. Like last time, we started by looking at art- historical work, representative examples of some of my work, and some good group folios that I have been a part of- so the participants could see some of the many possibilities of woodcut. I also showed them the kind of ink we'll be using, and the tools. We discussed ideas for everybody's first prints and I gave advice as to what would work and what might not. The last part of tonight was to cut everyone a block of wood, and I demonstrated how to surface them with the wood filler. As it turned out, I was so busy I didn't have time to take out my camera and get any photos, but it have likely been my unruly piles of prints and books, so nothing missed there. Next time people will be cutting and maybe we'll have something worth showing. Yesterday afternoon I was presented with a surprise project- to mat and frame a photograph before the end of the weekend. This would be an effort in a good cause, to make the old family home look just a little nicer in an effort to get it sold. A few examples of my own artwork that aren't likely to offend potential buyers (and I've had my work banned at times by people who feared that) are already on the walls. This time it's a photo taken on a family trip to one of our ancestral hometowns in Italy. I was handed the photo and an old frame of matching proportions. The rest was up to me. The timing for this task actually wasn't bad, since I was planning to spend the day at the Studio and all my mat cutting stuff has been there for a while. Plus, I have an old piece in mind to submit to an animal theme show coming up in Belmar next month, and it will require a new mat. So this morning I brought with me a few suitable pieces of mat board. 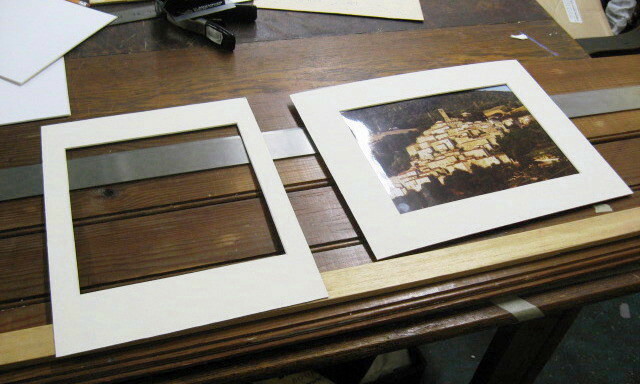 Picked one, cut it in two to make two window pieces, calculated and cut the windows. The results can be seen below, the Italian scene on the right. The latter will still need to be properly mounted and wired, but that can be done at home. After a lunch break I went on to my second big task, building a couple of new bench hooks. 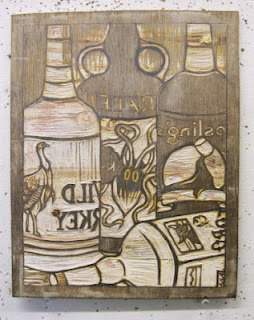 Actually I made a few of these last year in time for the fall edition of my woodcut class in Belmar, using some scrap plywood. With another round of classes due to start next week I decided to make a couple more, but a little larger and sturdier. I raided the family basement for some old boards (despite 15+ years of building projects there's still a lot down there), and with the help of various vintage tools, built a couple of bench hooks that will be potentially useful for the upcoming class. Meanwhile, Molly was also around through most of the afternoon, much of that time spent working on the big dragonfly piece that she started a few weeks back. 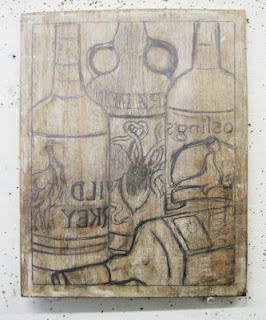 The quick work of routing is done, so now begins the much longer process of using woodcut tools to carve the surface. And though hand carving doesn't create nearly as much dust and noise as using the router, she still decided to take it outside today to take advantage of the beautiful weather, as nice a day as any we're likely to see this summer. 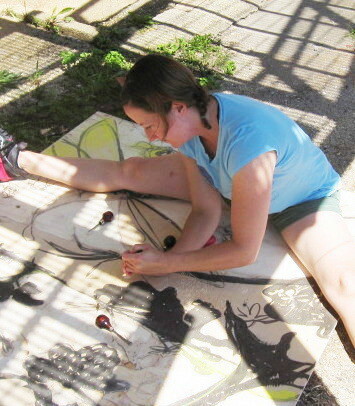 Now, you won't see me sitting on a block that I'm carving (for one thing, I don't think I could sit like that if I wanted), but if I was working on a block as large as this, I might be tempted to try. I decided to commit to the two panel standard diptych format for this block, and the most recent version of the scene, with the two lamp posts to either side. So yesterday I stopped by briefly to prepare a block. 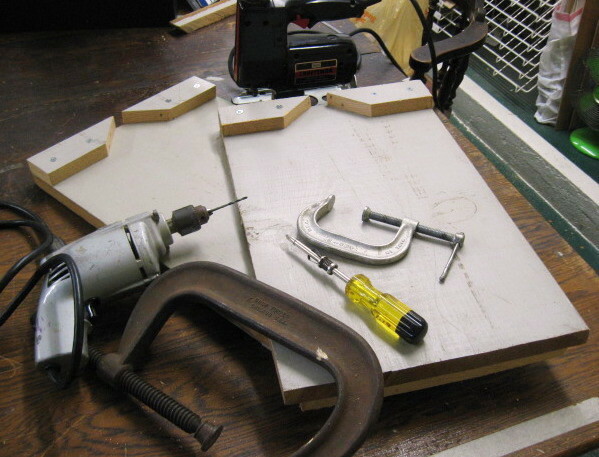 Had a few pieces of wood already cut to size, so it was just surfacing it with wood filler. Didn't bring the camera yesterday, but I've shown this part of the process before. Today I was back for a few hours, bringing my paper sketch with me. I produced a simplified version (in mirror reverse) of that sketch on the block. The next step will be to adjust perspective and proportions in the basic structures, and after that, a lot of detail. Figures are a long way off, but at least this thing is started. Despite a very annoying head cold that showed up over the weekend, I was determined to finish this print today. Looking at last Friday's color experiments all weekend gave me some ideas before I set foot in the Studio late this morning. 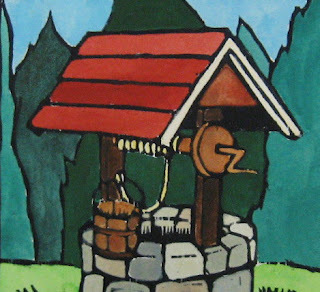 I had decided that the dark wood color for the upright posts supporting the well's roof had to go- they visually disappeared into the intended dark green of the background trees. Went with a very light tan color instead. For the crank and the bucket, a medium brown, one a little more neutral than those I was trying last week. The stones aren't exact individual matches to the first version, but it's the same range of warm and cool brownish gray colors as last time. The red roof is pretty much the same as well. My first attempt at the background trees was a mix of zoisite and cascade, heavier on the former, but it was a bit too neutral. Overlaid a few washes of more intense greens to get what you see above. I thought it was looking pretty good. Molly passed through for about 2 minutes (lured in by free tomato plants I offered her) and gave her approval to the new version. Looks like it's done. Next time I print I'll make another copy to match this one. 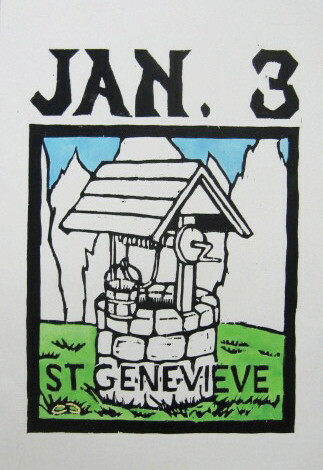 I had a few hours to spare today, so I went into the Studio to work out some ideas for the St Genevieve print. The above image shows evidence of some of those experiments. For example, originally all the background trees were a medium wash of phthalo green (still seen at the far left and right) but today I overlaid two of them with new colors. The big patch in the middle has a heavy wash of cascade green (named for the evergreens that cover much of the mountain range of the same name), while I added zoisite genuine (a mineral pigment, gray shading toward green) to the next section to the left. Both colors separate better from the red roof. Probably some combination of the various colors will be used in the final version. I also spent time trying out different colors on the wood in the well. Tried the upright posts as a much lighter color, but I thought it blended in too much with the stone, so I made it much darker. The color of the wooden bucket also changed a few times. These areas are going to require a bit more thought. Meanwhile, I started putting down some colors that I was relatively sure of on the second proof. The green grass and the blue sky will remain the same as the first proof, both premixed colors going back to my Carbondale era palette, so they went in quickly. I'll get back to it next week. The past few months have been tough times for the Belmar Arts Council's Figure Drawing group. A lot of the models we have been using have disappeared. Some moved out of the area, some have found actual jobs, etc. Looking back, I think we've only met once in the past 3 months, with all other sessions cancelled for lack of models. That may be turning around. Got the word late in the day that we had a model scheduled. New one for us, but with plenty of experience, and local to the Asbury area. We had a small crowd tonight, perhaps from recent habit, so plenty of space to move around. We did four short poses, then chose one of those to turn into a longer pose for the rest of the night. Not including breaks, I had about an hour to work on the above charcoal. There are a number of issues with the drawing, but those present tonight thought I had captured her pretty well (other than ignoring her considerable tattoo collection), including the model herself. Of course, I'll have charcoal stains on my hands for a day or two, but a small price to pay to get some good drawing practice in. I was able to get an early start today, so I was able to get to the Studio by a reasonable hour. First step was to tape the two copies of the St Genevieve print to a drawing board. While the tape dried I got out my watercolors and started thinking about color. As I mentioned the other day, there is a goal to have all prints in the series have a similar look, and that applies to color as much as drawing. Some of the premixed colors in my watercolor box are the actual colors mixed when I started the series back in 1994, so maintaining color traditions isn't too difficult. Once the tape dried, I colored the greens first and the blue sky, then the stone for the well. After a lunch break, I colored all the wood. This first pass isn't bad, but it doesn't quite all go together. My first thought was that the red roof was too bold. Molly was in so I had her take a look- she liked the red, but thought the problem could be solved by changing the color or value of the background trees. I brought it home to look at for a few days. Next time I go in to work I'll try some changes to this first proof, and use whatever I learn when I start coloring the second proof. 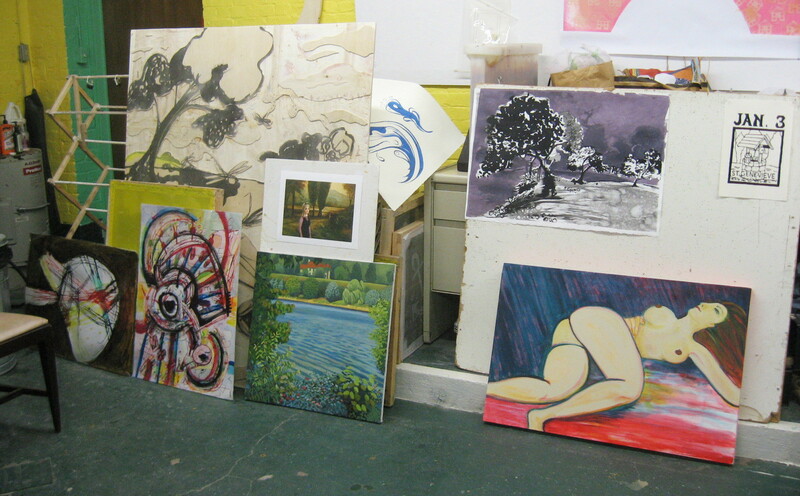 Nine artists brought work to our Studio tonight for our regularly scheduled critique night. All are regulars, though some we haven't seen for a few months. 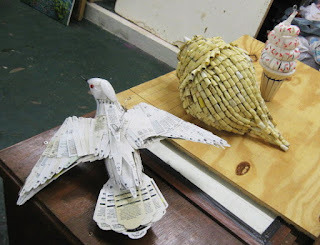 Some of the work built on previous pieces, some were completely new. A few things were dictated by the time of year. Above is a wide view capturing much of what we saw. From left to right: Tim's colorful mixed media drawings, Jill's photo collage and painting (both in front of Molly's dragonfly wall hanging), Molly's mixed media landscape, Sheilagh's figure painting, and my latest saint proof. 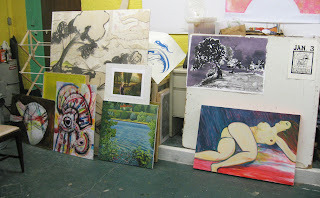 Vince brought more grid paintings (above left), but this time with collaged drawings added. Edy's paintings (above right) continue her variations on cathedral interiors. We had some sculptural work as well. Lisa brought in a new group (above) of her typical 3D works made from collected garbage. 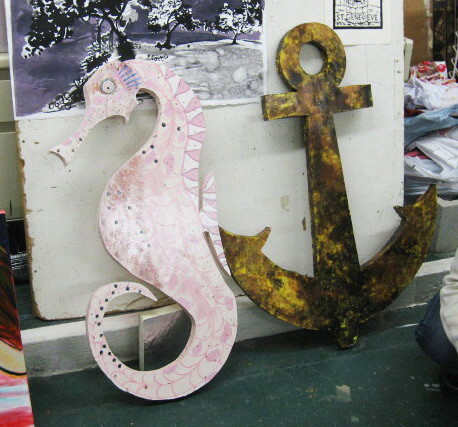 Mary's 3D works (below) are cut from insulation foam and painted with spare colors- not personal work, but commissioned decorations for an upcoming prom or formal dance with a sea theme. As mentioned up top, there were some common themes among the works shown. Molly noted how the ink based landscape she put up (and a few others she pulled out) seem to be a tradition for her in recent years when school ends and the weather gets warm. Mary's pieces are definitely linked to this prom time of year. Vince and Edy's paintings are both continuations of bodies of work they have been exploring in recent months. 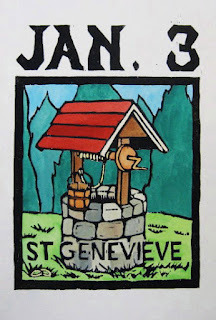 The discussion around my piece was mostly related to the idea that I was seeking to maintain the design style found in the saint prints going back to 1994- not my motivation for doing so, but that I could just change drawing/composition styles at will. I returned to the Studio today to follow up on the ideas I was developing yesterday for the latest boardwalk print. For this one I went back to the classic diptych format, and a composition that isn't too far different from the one I presented in the critique a few months ago. I decided to start over with a new piece of paper as the old one had too many scribbles and eraser marks to continue using. 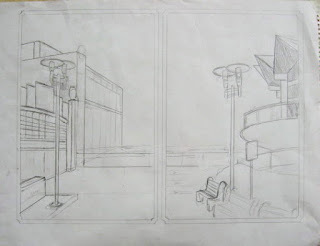 The main difference is that I moved the location of the lamp post that had been near the middle of the composition over to the left, closer to Convention Hall. Last night I looked at some of my recent photos of the building, details much easier to see on the computer screen than on the camera's tiny viewscreen, all I had to work with yesterday afternoon. With this information, I was able to establish a more plausible location for that center post and the landscaping that contained it. The two buildings are a little more detailed and accurate than the earlier sketches, though both will need more when I get to the drawing on wood. I paid a little more attention to the benches by the restaurant, making use of the sketches I had done on locations in early May. 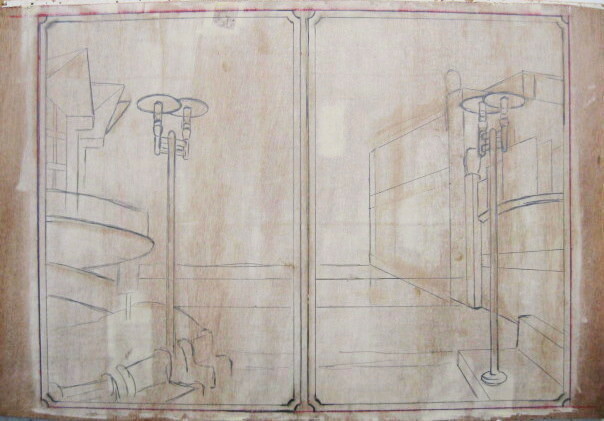 Moving the lamp post opens up the middle space a little more than the earlier diptych. This view also brings back more of the boardwalk itself, and consequently, a larger piece of the beach and ocean. It's not as big a piece as I had originally envisioned, but at this point I thinking I may save a lot of those details that I had planned for the day time print and spin them into a whole new image. If there's time, I'll show both this and St Genevieve at next week's critique.